A team of archaeologists from the Université libre de Bruxelles (ULB) has discovered a spectacular tomb containing more than eighty individuals of different ages. This discovery – provisionally dated to around 1000 years ago – was made at the site of Pachacamac, which is currently under review for UNESCO World Heritage status. Pachacamac, situated on the Pacific coast about thirty kilometres from Lima, is one of the largest Prehispanic sites in South America. Professor Peter Eeckhout – under the auspices of the ULB – has been carrying out fieldwork at the site for the past 20 years. The 2012 season resulted in some particularly remarkable discoveries. The Ychsma Project team undertook to record and excavate a series of Inca storage facilities (15th-16th c. AD), as well as a more ancient cemetery which had been detected during exploratory work in 2004. It was here – directly in front of the Temple of Pachacamac – that the most important discovery was made. A scatter of later period burials was found to conceal an enormous burial chamber 20 metres long ; miraculously, it had survived the pillaging of the colonial period – which was particularly intensive on this site – and was completely intact. The tomb is oval in outline, excavated into the earth and covered with a roof of reeds supported by carved and shaped tree trunks. A dozen newborn babies and infants were distributed around the perimeter, their heads oriented towards the tomb. The main chamber was seperated into two sections, separated by a wall of mud bricks which served as a base for yet more burials. Inside the chambers, the archaeologists uncovered the remains of more than 70 skeletons and mummies (many of which still retained their wrappings), all in the characteristic fœtal position. The burials represented both sexes and all ages, and were often accompanied by offrenda including ceramic vessels, animals (dogs, guinea pigs), copper and gold alloy artefacts, masks (or ‘false heads’) in painted wood, calabashes, etc. These items are currently under restoration and analysis. Babies and very young infants were particularly common. The team’s group of physical anthropologists, under the direction of Dr Lawrence Owens (University of London), have posited the possibility of a genetic relationship between many of the individuals, on the basis of certain morphological traits recorded in the skeletons. Certain of the individuals suffered mortal injuries, physical trauma or serious illness. 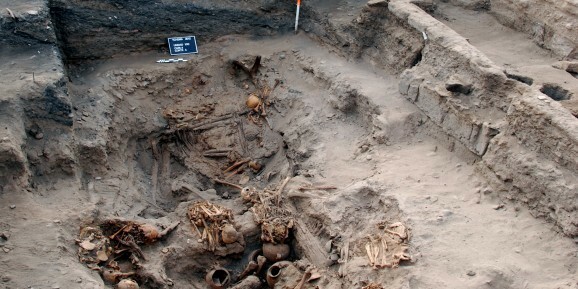 Previous work by the Ychsma Project has revealed the extensive presence of disease in the Pachacamac skeletal population, leading to the suggestion that the affected individuals had, as testified by Inca sources, travelled to the site in search of a cure: a form of Prehispanic Lourdes. Professor Eeckhout and his colleagues are currently carrying out laboratory analyses aimed at answering numerous questions that have arisen concerning this discovery, and how to contextualise it within the wider context of the site and the period(s) in question. Were the infants sacrificed ? Were the bodies all interred at the same time as a form of communal burial, or was the chamber reused over longer periods of time like some sort of crypt? Did the individuals come from Pachacamac or further afield? Did they belong to the same family or larger kinship group ? What was their cause of death…? The artefacts found in the tomb date it stylistically to around 1000 AD, although this is yet to be confirmed radiometrically. The importance of the site cannot be overstated: Pachacamac is a candidate for inclusion on the list of UNESCO World Heritage sites. The Ychsma Project benefits from the support of the ULB’s Centre for Archaeological and Heritage Research, the ULB Foundation, and from the National Fund for Scientific Research.